Late-blooming soulman's debut is worth the wait and then some. Listen to Charles Bradley and you will hear a man living his dream. Born in Brooklyn in 1948, he spent much of his childhood on the streets. The brightest moment of his youth came in 1962, when he saw James Brown's fabled performance at the Apollo, which left him so astounded that he instantly decided his future would be as a singer. However, there were plenty of setbacks and delays -- he lost jobs, he moved a lot, his brother was murdered. But in 2002, Daptone Records spotted Bradley's talent and drive and signed him soon thereafter. 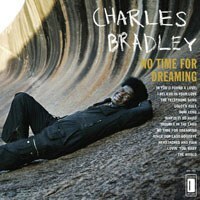 And now, roughly a decade after that deal and 49 years after that fateful 1962 night, Charles Bradley is finally releasing his debut album, No Time For Dreaming. As you may have guessed, it nods to the great soul men of yore -- Brown, Al Green, and Otis Redding included -- and does a fine job of paying them homage. After all, Bradley was around when the music he imitates was in its prime, so he undoubtedly has a good grasp of his particular genre. But unlike Aloe Blacc, Raphael Saadiq, and Bradley’s fellow Daptone late bloomer Sharon Jones‘ records, which make welcome stabs at soul revivalism but still sound unmistakably modern, No Time For Dreaming doesn't sound contemporary in the slightest. But that’s the point. It sounds like everything was recorded at once, and the occasional female backing vocals could have been plucked directly from Aretha Franklin’s I Never Loved a Man the Way I Love You. But most of the authenticity has to do with Bradley’s voice, which is rugged, full and, above all, powerful. It's also very versatile: Over the course of a few tracks, Bradley transitions from a desperate, Brown-esque near-shriek ("The World (Is Going Up in Flames)") to a smooth croon ("Lovin' You, Baby"). Those pipes are at their most affecting on “Why Is It So Hard”, which is the album’s apex and Bradley’s story in capsule form (“Why is it so hard to make it in America/ I’ve tried so hard to make it in America”). Maybe this guy is why there’s an age limit on “American Idol” -- he’d put all the younger contestants to shame. Musically, No Time For Dreaming is mostly brass-heavy Al Green-circa Call Me pastiche. The Menahan Street Band, who accompany Bradley throughout the record, do everything a great backing group should: Stay away from sounding stagnant without knocking the front man from the fore. The trumpets and saxophones are usually out front and often trace the vocal melody, highlighting the powerful hooks. The guitars sit a little lower in the mix but still add a subtle flair, providing a foundation as integral as the rhythm section. All of this functions as a necessary reminder of how awe-inspiring bona fide soul can be when done well. You don’t need to know his back story to fall in love with Bradley -- the music speaks for itself. This album has been a looooong time coming, but it's more than worth the wait.